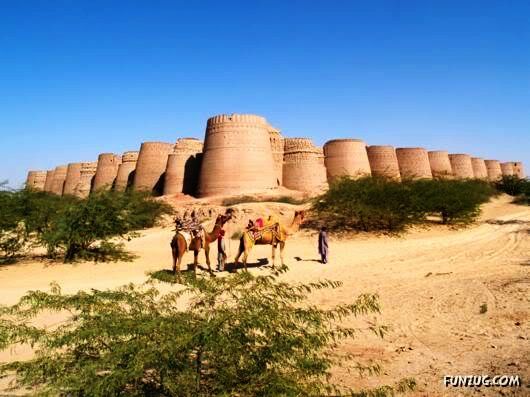 Cholistan desert of Pakistan is a strange desert as it is dotted with small, medium and large forts and fortresses after every few kilometres. These inter-woven chain of fortresses has existed for many centuries providing an excellent chain of mutually supported defense lines in the desert. 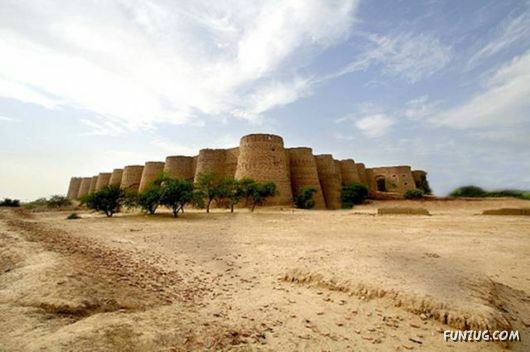 I once had the opportunity to go into the Cholistan desert and saw many of these fortresses But when on the last leg I came across the formidable Derawar Fort, I was really overawed by its grandeur, massiveness, size and majestic glory which one could observes from miles. 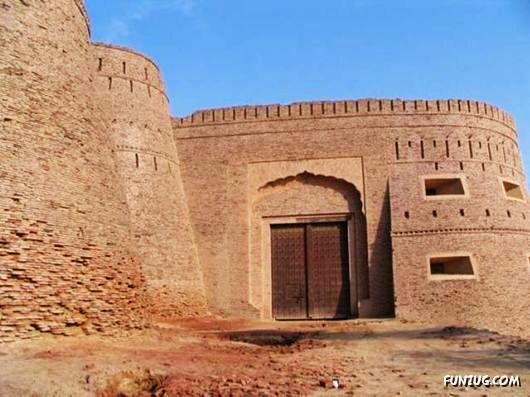 The Derawar Fort can be accessed either from north downwards from Bahawalpur or Ahmed Pur East or from Rahim Yar Khan moving on the Desert Road. The Rahim Yar Khan route is much easier, as it is along a metaled road (though midway, where after it turns into a desert track up to the fort), while for other two routes from north downward have quite a distance across desert and one has to have a local driver and guide to access the fort. 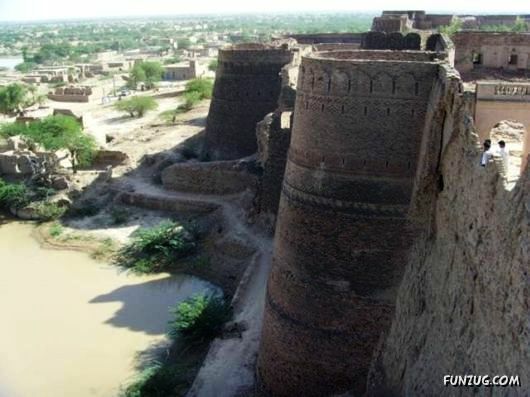 Since I was located at Rahim Yar Khan, I adopted the easier yet longer route to the fort. 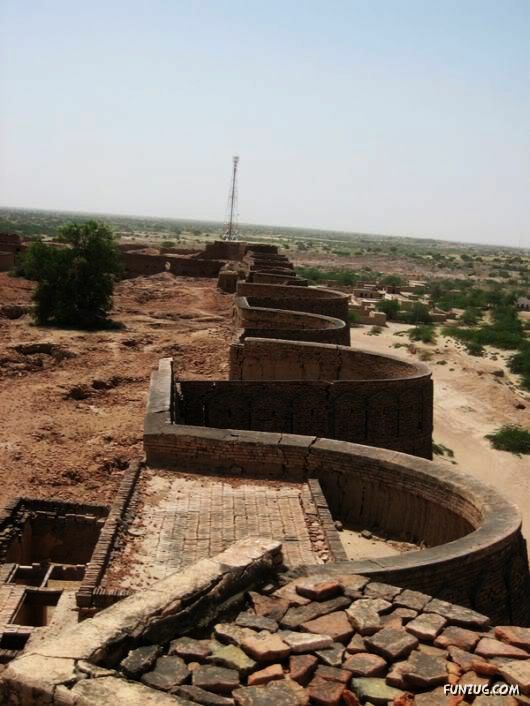 The rulers and soldiers who lived here and guarded the fort are long gone, and the fort stands alone and deserted, yet the strength of the fort can still be felt from its high rising bastions which total forty in number' and are largely intact even after bearing the harshness of the desert winds and temperature. Its ramparts are wide and spacious, presenting an imposing structure unlikely to be breached. However, the inside of the fort is a heap of rubble. There are two guns lying in the open, which were once part of the artillery regiment of the Bahawalpur army. Inside some of the rooms, the remains of old furniture and royal dresses can be seen almost destroyed and worn out. Most of the rooms have their roofs fallen and are a pile of rubble rather than reflecting the times of glory and royalty. 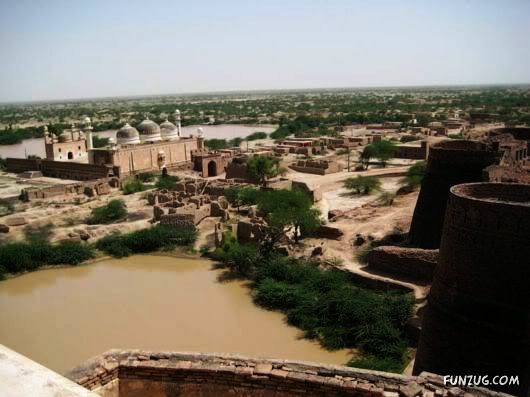 Located some 45 kilometers from the town of Dera Nawab, the once seat of the Abbasi rules, this square shaped fortress has a circumference of 1,500 metres with bastions standing thirty metres tall. 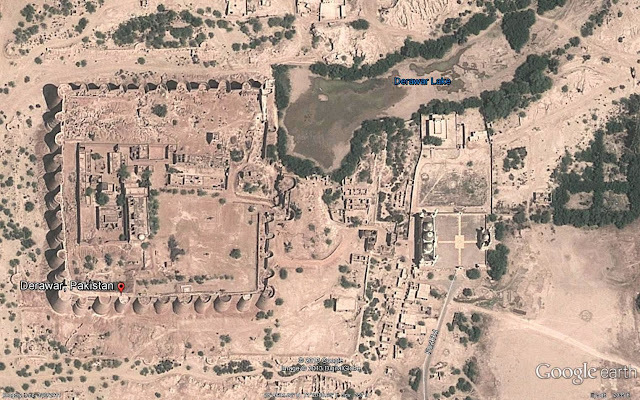 The fort entrance is on the east as can bee seen from the map above. 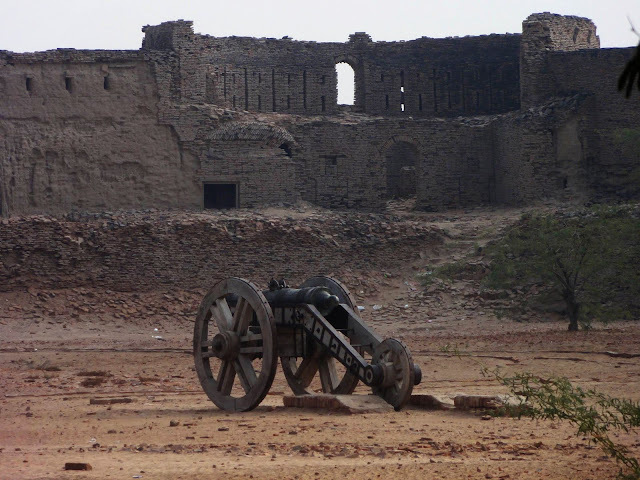 With the vast Cholistan desert serving as a backdrop, the majestic fort is a sight to behold. Beside the fort is a hundred years old white marble mosque, which was built by Nawab Bahawal Khan in 1849 with cupolas and domes. The mosque seems to be a replica of the Moti Mosque in the Red Fort of Delhi. The mosque is said to have been built for the nawab’s personal holy man, Pir Ghulam Farid. 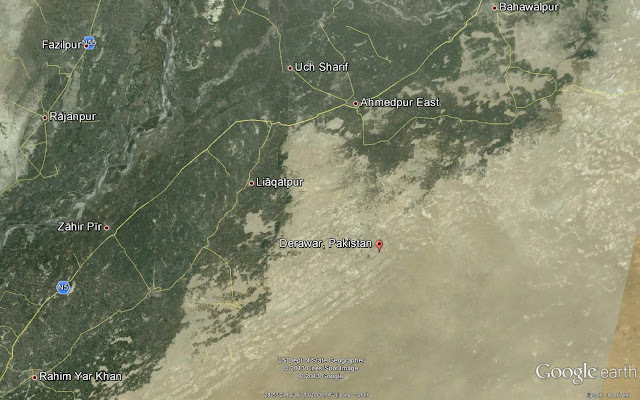 There is a family grave yard of the Abbasi Nawabs in the area. Their tombs are built with marble and decorated with blue glazed style which contrast beautifully Ochre landscape. The graves also include the elegantly domed marble tomb of the last nawab’s English wife. 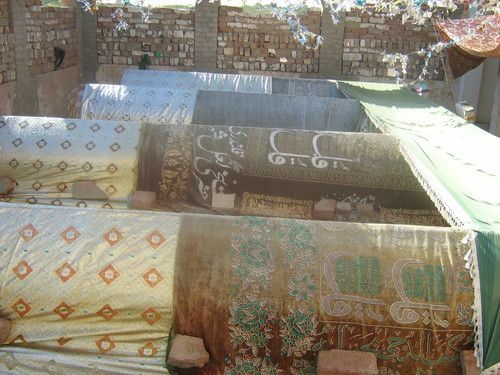 There are some graves near the fort which are said to be of the companions of the Prophet Muhammad (PBUH) and the other Muslim reformers who came to spread Islam in this area. These persons are believed to have embraced their death at the hands of the Hindu rulers who were against these proselytizers.